Masters of socially shareable content, BuzzFeed need little introduction. We caught up with Tom Phillips of BuzzFeed UK to learn how they used BuzzSumo to create their Social Barometer, tracking the most viral content about the UK election 2017. Two factors drove Tom Phillips and the team at BuzzFeedUK to create and publish the BuzzFeed Social Barometer. With the United Kingdom in an election season, Tom and his colleagues wanted to bring their coverage of the Prime Minister’s June 2017 snap election into the national conversation. And, with fake-news controversies in mind, they particularly wanted to focus attention on how people access and share news via social media. Tom knew that traditional media reports alone, tv and newspaper, would give an incomplete impression about the popularity of candidates and the progress of the election. The social barometer aims to complete the picture by providing ongoing analysis of the links to news stories about the election and how often they were shared. The team used BuzzSumo’s data (note: the two companies are unrelated, despite similar names) to create the social barometer and released the barometer as part of a content package with an article about the alt-left. 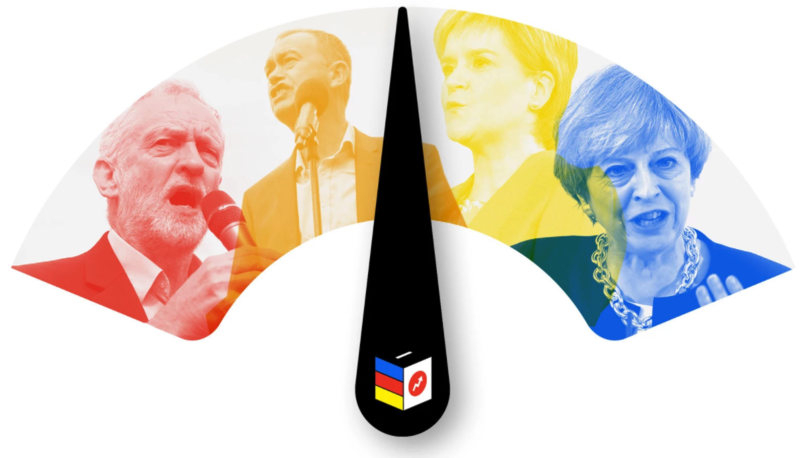 To produce the barometer, the BuzzFeed team chose multiple terms related to the UK general election and entered them in BuzzSumo’s most shared content tool. Next, the BuzzFeed team reviewed the list and discarded results that weren’t relevant. (The export function available to BuzzSumo’s paid subscribers makes this type of analysis much easier.) The remaining URL’s were pared down to a final set of 250 articles, which were classified by party and sentiment. As the election progressed, BuzzFeed added any new or emerging terms to their list and repeated their searches. The team decided to measure the impact of the barometer by social shares and traffic to the site. They also wanted other news outlets and blogs to mention the barometer. So far, the first post, announcing the barometer, has been shared 3.8k times. And the three posts released as part of the series accumulated 6725 shares and 40 backlinks by June 26. The barometer has been mentioned in other coverage of the election. Notably, the barometer was referenced in an article published by the London School of Economics, known for its leading role in the social sciences. Although the nature and audience for each of these mentions is different, each provide BuzzFeedUK with the desired outcome: a place in the national conversation about the election. Try BuzzSumo Now for Free!